Those able to harness the power of information and communication technology are reaping ever more benefits. But in poor countries, digital poverty is holding back growth and development, leaving them further behind. Singapore is this year’s leader of the global ICT revolution. Its government has a clear digital strategy and is an exemplar of online services and e-participation tools, which filters down to its industries and population. The country has the highest penetration of mobile broadband subscriptions per capita in the world and more than half of the population is employed in knowledge-intensive jobs. The country topped this year’s Global Information Technology Report (GITR), published by INSEAD in partnership with the World Economic Forum and Johnson Cornell University, due to its leadership in business, innovation environment and government usage of ICT. The report benchmarks 143 economies in terms of their capacity to prepare for, use and leverage ICT. The top ten in the 2015 report are once again dominated by Western European economies and Asian advanced economies. Finland takes 2nd place (down from 1st last year) while Sweden 3rd, the Netherlands 4th, Norway 5th, Switzerland 6th and the United States 7th all remain unchanged from 2014. The United Kingdom moves up one place to 8th, Luxembourg makes it into the top ten at 9th place and Japan makes an impressive leap up 6 places to 10th position, due to increasingly high internet penetration, high mobile usage and government adoption. 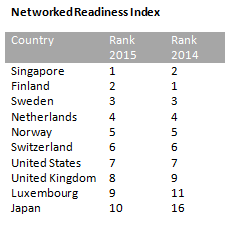 What gives these high income countries their “networked readiness advantage” is their education systems and concerted policy efforts to facilitate innovation and commerce, which allows them to take advantage of digital innovation in a way that emerging economies cannot. From a global point of view, however, we see reasons for concern. Not only does this year’s report show that the world’s emerging economies are failing to exploit the potential of ICTs to drive social and economic transformation, but the gap between the digital haves and have nots is increasing. Those in the top 10 percent of the ranking have seen twice the level of improvement since 2012 as those in the bottom 10 percent. This is also reflected by progress among the world’s largest emerging markets. Lately, their journey towards network readiness has been disappointing. While the Russian Federation is highest-placed among the BRICS nations, climbing nine places to 41 and China remains at 62, all other members of the group have declined. India dropped six places to 89, Brazil dropped 15 to 84 and South Africa is 75th, down five spots. And the example of the BRICS is not unique. Many other emerging countries that have improved their networked readiness over the last decade or so are now facing stagnation or regression. Indonesia is one such example which has fallen 15 places this year down to 79th position from 64 last year. This is partly due to persistent divides within these countries between their rural and urban areas and across income groups, which leaves a large portion of the population out of the digital revolution. Despite the top 30 places being dominated by high-income countries, there are a number of other countries in which ICT is being used to stimulate growth and reduce inequality. Here, governments are using a number of instruments in their toolkits such as balancing liberalisation and regulation to stimulate healthy competition across their economies. Among those that have made considerable improvements in terms of their ranking are Lithuania (31st)), Malaysia (32nd) and Latvia (33rd). Other examples of countries hitting above their weight include Caucasian countries – Kazakhstan (40th), Armenia (58th) and Georgia (60th) – as well as Mauritius (45th) which is far ahead of the other sub-Saharan African countries. Even so, in a number of sub-Saharan countries, both large and small, progress is being made where their ICT markets have been liberalised. For example, Kenya, Nigeria and Tanzania are all beginning to see the benefits of market reforms as well as smaller economies like Cape Verde, Lesotho or Madagascar. There is no doubt that technological innovation is influencing lives in all types of economies – social media are changing the ways in which we interact with each other at an individual level and at an industry level. Big data is being used to create new products and generate new markets. In developing countries, however, information and communication technologies (ICTs) are even more fundamental to reducing inequalities, to taking people out of poverty and to creating jobs. The internet remains nonexistent, scarce, unaffordable or too slow in vast swathes of the developing world. While internet penetration has been growing, its growth has slowed lately. A fresh internet revolution is needed to connect the ‘next two billion people who still do not have online access’. This will require concerted efforts to extend mobile broadband to large parts of the developing world. To achieve an internet revolution and bridge the digital divide, developing countries must consider long-term investments in infrastructure and education. Governments can accelerate the process through sound regulation and more intense competition. If fostered properly, ICT can transform economies through productivity gains, reducing information costs, allowing new models of collaboration and changing the way people work. ICT fosters entrepreneurship and wealth creation. But widespread ICT use by businesses, government and the population at large is a pre-condition for all these benefits and opportunities to materialise and to be accessible to the largest numbers. Inclusive growth is indeed within reach, and ICTs can play a critical role in making it a global reality. The Global Information Technology Report uses a combination of data from publicly available sources and the results of the Executive Opinion Survey of more than 13,000 executives conducted by the World Economic Forum and partners. It gauges usage, socio-economic impact, political and regulatory environments and the climate for business and innovation as well as ICT infrastructure, affordability and ICT skills. Bruno Lanvin is Executive Director for Global Indices at INSEAD. Amongst the top ten countries only has avpopulation of about 300 million.It has capitalism and risk taking abilities advantages. Large countries like China and India suffer from these two qualities, and historically have been isolated. The real problem may be the significant cost to feed ICT throughout; cost enormous amount of money they don't have, the desire is there, so the progress is slow. It will be a good metric to indicate the ICT cost per million per country.